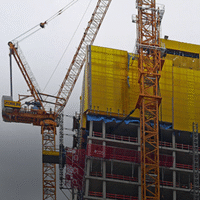 For a quick review, the construction industry uses hoists to transport workers and supplies at a high-rise job site. See this blog post for more information. Efficient and safe delivery of these assets is paramount to the success of a construction project. Damage to Existing Wired Communication System - A traditional system consists of a wired solution that may sustain damage with use. The regular up and down of the hoist may tangle and fray the wires that connect the ground level fixed radio with the lift as it transports equipment to the called upon floor in the building structure. Since the Ritron system is wireless, this problem is eliminated. Short on Time - Construction projects depend on adhering to a strict timeline in order to meet the requirements of the contract. Since our solution is wireless and battery operated, deployment is extremely fast. No trenching is required, and our hoist solutions work with existing two-way radios. Safety - Older systems with frayed or damaged wiring may be susceptible to transmitting intermittently and incoherently. The Ritron solution is wireless, dependable, and consistent, with a callbox in a fixed location on the ground floor, and another callbox on each floor. In an emergency situation, workers know exactly where to go to communicate. Compliance - Construction projects face a myriad of regulations, inspections, and potential delays if the site is found out of compliance. We have been involved in projects where the city (or other regulatory entity) required the hoist to have a communication system in place. Fines and delays were avoided since our wireless solution is fast and easy to implement. Over Budget - Cost overruns plague construction projects. Our solution is cost effective when compared to wired solutions. Products that are used in a hoist operations include our Q Series, XT Series, XD Series, and DMR Series Callboxes.